Wireless and locative technologies are enabling people to break away from traditional computer interfaces. Mobile devices are mediating new kinds of social interaction and responding to physical location and context. What kinds of creative, social, economic and political expression become possible when every device we carry, the fabric of the urban environment and even the contours of the Earth become a digital canvas? The event launches a new international network (PLAN), bringing together artists, activists, hardware hackers, bloggers, game programmers, free network builders, semantic web philosophers, cartographers, economists, architects, and university and industry researchers. A new generation of pervasive technologies is enabling people to break away from traditional desktop PCs and games consoles and experience interactive media that are directly embedded into the world around them. And locative media, the combination of mobile devices with locative technologies, supports experiences and social interaction that respond to a participant’s physical location and context. Together these convergent fields raise possibilities for new cultural experiences in areas as diverse as performance, installations, games, tourism, heritage, marketing and education. The creative industries are also beginning to take up these opportunities, led by artists who are actively charting out the potentials and boundaries of the new pervasive and locative media. Other cultural sectors have also been exploring the potential of pervasive and locative media including the games industry through commercial examples of locative games played on mobile phones. Researchers have also demonstrated applications in heritage and tourism, for example personal tourist guides and outdoors augmented reality displays and as well as in mobile learning experiences and participatory local history mapping projects. A key characteristic of this research is its interdisciplinary nature, with many of these projects combining practicing artists, technology developers and also ethnographers, whose studies of early experiences that are actually delivered as public artworks have yielded new insights into the ways in which participants experience pervasive media, and, conversely, new metaphors for engaging in locative media. However, realising the full potential of pervasive and locative media requires several further developments. 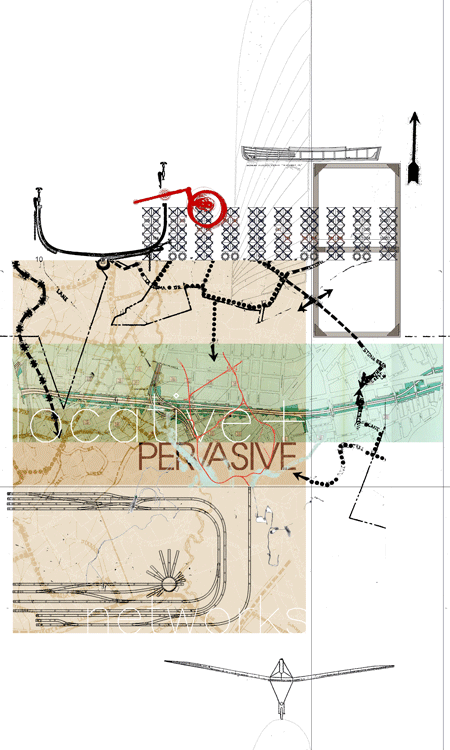 >from *First Workshop of the Pervasive and Locative Arts Network (PLAN)*. Conference & workshop at the I.C.A. (The Institute of Contemporary Arts, London, UK). February 1-2, 2005. > spacenamespace. about annotating space with metadata; about building semantic models of places; about exchanging geospatial data in rdf. > buddyspace. an open-source cross-platform instant messaging and geo-location tool. the semantics of presence.